Dalmatians are an active breed and require adequate exercise to keep them fit mentally and physically, they are best suited to a family with an active lifestyle. If you love the breed but do not have an active lifestyle please consider an older Dalmatian as an addition to your family. 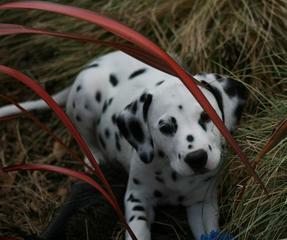 Dalmatians love to please and to spend their time with you! An older Dal will have a slightly lower level of physical exercise and will make an excellent companion. Dalmatians shed. Don't let the short hair fool you! Their coat is easily managed and do well when fed a natural diet - either raw or homemade food. Our Dals are fed raw food and occasionally a cooked diet. We give supplements for coat condition that include natural oils and vitamins.